Applewood Plumbing Heating & Electric awarded $1,000 as part of their monthly Caring Community Giveaway to the Honor Bell Foundation, a non-profit based in Denver. The Honor Bell Foundation’s mission is to create a community of veterans to foster public appreciation of military service and honor their fellow veterans with a proper, final tribute. For Coloradans who have sacrificed selflessly by serving our state, the Honor Bell Foundation offers a final salute — a graveside tribute that resounds with tradition, dignity, solemnity and respect. “We’re proud to support the Honor Bell Foundation and show our support for those who have served our country,” said John Ward, president of Applewood Plumbing Heating & Electric. 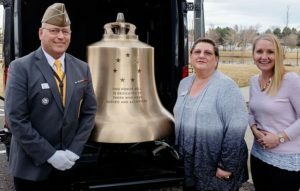 The foundation provides a unique funeral honor for deceased military veterans through the slow ringing, known as tolling, of a ceremonial bell. To accomplish this mission, the Foundation has produced and will toll the Honor Bell, to offer honors at the funerals of U.S. military veterans and personnel killed in action and to augment the dignity and respect that should be paid to those that have served our nation. The Bell is also used at public events, schools, and other opportunities to educate young people and the general public about the significance of dignity, honor and respect owed to our military and fallen heroes. “This $1,000 donation from Applewood will help us render Bell Honors for more of Colorado’s deserving veterans. We’re very grateful for the support from Applewood,” said Michelle Mallin, Executive Director of Honor Bell Foundation. For more information about the Honor Bell Foundation visit www.honorbell.org.